The next meeting of LRUG will be on Wednesday the 9th of December, from 6:30pm to 8:00pm. Our hosts Skills Matter will provide the space, at our new venue The Crypt (it's very close to our previous venues). Despite the new venue it's still important for people to register so Skills Matter know how many people to expect and set the room up correctly. I also think that of the major Ruby ORM libraries, only Sequel is really aligned with DDD in the first place, so if you're using anything else you've already compromised the model (although again, possibly that's a discussion for another time). A video of Alex's talk can be found on the Skills Matter site. A video of Rob's talk can be found on the Skills Matter site. At the start of each meeting we have 10-15 minutes set aside for anyone in the room to speak. It's run "open" style, so you don't need to ask for permission, just stand up and say something. In the past we've had new site announcements, gem demos, new framework announcements, overviews of recent conferences; basically anything you might post a link to on something like Ruby Flow, you should think about mentioning here. We aim to finish up the meeting by 8pm, after which we mosey on down to The Crown Tavern to continue the evening. If for any reason you can't make the talks feel free to come along to the pub and mix with your fellow rubyists. In fact, if you get there early, you can get the first drinks in! Registration isn't mandatory as there's always room in the venue on the night, however, registration lets Skills Matter arrange the room properly so if you don't register you might have to sit on the floor. So, please do register. The next meeting of LRUG will be on Wednesday the 11th of November, from 6:30pm to 8:00pm. Our hosts Skills Matter will provide the space, at our new venue The Crypt (it's very close to our previous venues). Despite the new venue it's still important for people to register so Skills Matter know how many people to expect and set the room up correctly. We're hoping for a "Ruby in Sys Admin" theme this month. John Arundel: Is Your Sysadmin Dumber Than a Hamster? How to automate your sysadmin out of a job, and into a more interesting job. Why aren't sysadmins as smart as developers? How do you build 100 servers in a day? A video of John's talk is available on the Skills Matter site and his slides can be found on Slideshare. Julian Simpson has seen things. Scary things. In a career that has spanned 15 years of Unix systems administration with detours into continuous integration and build management, he's seen quite a lot. By day he works in a Ruby on Rails development team in London. By night he blogs about CI as The Build Doctor. In this talk he's going to discuss testing infrastructure before you deploy it, more Puppet, declarative systems, CI, and top tips for developers who want to get code into production and still have time to go to the pub afterwards. A video of Julian's talk is available on the Skills Matter site and his slides can be found on Slideshare. At the start of each meeting we have 10-15 minutes set aside for people to speak about anything they think is of interest to the group. It's "open" style, so you don't need to ask for permission, just turn up and say something. In the past we've had overviews of recent conferences, discussions of alternative JS frameworks for Rails, announcements about new events, calls for help reviewing patches for Rails, a quick demo of a new gem. Basically anything you might post a link to on something like Ruby Flow, you should think about mentioning here. At the end of the meeting we like to head over to The Crown Tavern for a spot of socialising over a beer or two. We're usually at the pub from about 8:00pm ish so if you don't think you can make the "proper" meeting feel free to come along just for the pub. It's fine to turn up to the meeting late though, you don't have to be there at 6:30 to get in! The next meeting of LRUG will be on Wednesday the 14th of October, from 6:30pm to 8:00pm. Our hosts Skills Matter will provide the space, at our new venue The Crypt (it's very close to our previous venues). We still need people to register though to make sure the room is set up properly. There was most interest in bumps but if you get on our mailing list you can let him know which you'd rather hear more about. A video of Brent's talk is available on the Skills Matter site. During our last meeting, Tom was surprised by how many people (both Ruby newbies and "Rails not Ruby" programmers) were asking questions about Enumerable, e.g. what map/inject/zip etc do. Tom has massive functional chops and is going to give a talk that starts with this and then expands into a rant about programming in a functional style. A video of Tom's talk is available on the Skills Matter site. We still have room for one more speakers, or we can let Tom and Brent talk for longer. Let us know if you're interested. We missed out on this during the Dojo meeting last month because of time constraints. We'll make sure there's time this month though. The idea is that we have 10-15 minutes at the start of the meeting for anyone to say whatever they think is interesting; you could announce a gem you've written, you could point out a nice plugin or tool that you've been using recently, you can mention a blog post that got you thinking, you could ask for some help on a pet-project, basically anything goes, just keep it short so that everyone else has time to speak! Our new venue doesn't have any capacity problems, so registration isn't mandatory. That said, it's really helpful if you do register with Skills Matter if you are planning on attending. Registration lets Skills Matter layout the room properly and make sure everyone has a name badge to help with socialising later. The next meeting of LRUG will be on Wednesday the 9th of September, from 6:30pm to 8:00pm. As usual our hosts Skills Matter will provide the space, at our new venue The Crypt (it's very close to the other venues). We still need people to register though to make sure the room is set up properly. The Dojo starts with the definition of a problem to be worked on. It'll be something relatively simple, but with enough scope for plenty of interesting choices to be made about the design. We'll have one laptop connected to a projector and two developers will pair on it to iterate towards a solution. Every so often, the "driving" developer (the one at the keyboard) will sit down, the other developer will become the "driver" and another member of the group will step up to complete the pair. Lather, rinse, repeat. For our Dojo, because the group is so large, we plan to split the attendees on the night into 2 or 3 groups to work on the problem and will time the "every so often" such that everyone should get a turn at the laptop. To help speed up the splitting into groups on the night you should add your name to a team on our spreadsheet. To frame the Dojo-ing we'll introduce the concept of Dojo's at the start of the evening in a bit more detail, as well as describe the problem to be worked on, and then at the end of the meeting, we'll go round each group and let them say how they found the experience and describe their solution. There'll also be one or two people floating around not participating, but making sure that the Dojo is running smoothly and giving advice to groups struggling. Hopefully everyone gets a turn at the laptop and so everyone will write some code on the night. We hope it'll be a good way of letting inexperienced developers see how more experience developers approach problems and hopefully learn a lot by watching and working with them. Of course, those experienced developers will also get a chance to be pulled up on things and forced to think outside of their, perhaps, fixed mindsets. There are still some details to be thrashed out, like what the problem will be, and how to split the meeting up into groups to ensure a even spread of ability in each group (see the spreadsheet). We'll discuss all that on the mailing list, so do sign up and follow along. The idea for this meeting wouldn't have been possible without help from Matt Wynne and Ivan Sanchez, who have both run Dojo's in the past and will be helping out on the mailing list and on the evening itself. There is also a video of the evening available on the Skills Matter site. Following on from last month there'll be 10-15 minutes at the start of the meeting for the analogue blog. The Analogue Blog is open for anyone to say whatever they think is interesting; you could announce a gem you've written, you could point out a nice plugin or tool that you've been using recently, you can mention a blog post that got you thinking, you could ask for some help on a pet-project, basically anything goes, just keep it short so that everyone else has time to speak! This meeting is going to be very different to our normal presentation-based meetings, and as such is bound to generate a lot to talk about. No-one likes to talk with a dry throat so, as usual, we'll head on over to The Crown Tavern for some sweet throat lubrication. Although we start the formal meeting proceedings at 6:30, and are open to late-comers, there are plenty of LRUG regulars who can't quite make it. If you're one of those feel free to head on over to pub for about 8pm, which is when we aim to finish up the Dojo. Our new venue shouldn't have any capacity problems. However, we'd still like for people to register with Skills Matter if they are planning on attending. Registration lets Skills Matter layout the room properly and make sure everyone has a name badge. For this event it'll also help us know how many groups to split up into, so please do register as early as you can to help us out. Also, there's a spreadsheet of teams you should add your name to if you are coming. This'll speed up the splitting into groups when we start the Dojo, and it'll also hopefully mean that each group has an even spread of abilities in it. Go add your name!. The next meeting of LRUG will be on Wednesday the 12th of August, from 6:30pm to 8:00pm. As usual our hosts Skills Matter will provide the space, at our new venue The Crypt (it's very close to the other venues). We still need people to register though to make sure the room is set up properly. Taryn East wants to talk to us about profiling. I've used the ruby-prof and kcachegrind tools a few times to profile some of the rails projects I've worked on. They're powerful tools that can let you dig down into the bowels of your code and find the real trouble-makers, but they require a bit of familiarity as they really are a bit of information-overload. So I thought I could give a talk on how to set them up - where/how to use them and what they can do for you. A video of Taryn's talk is available on the Skills Matter site. AMQP is a powerful, flexible and completely open messaging standard. Capable of scaling to millions of messages a second with incredibly low latency, AMQP is an fantastic backbone on which to build service architectures. In this talk I'll give you an overview of the AMQP standard, an introduction to synchronous and asynchronous libraries for working with AMQP in Ruby and some examples uses. If he's finished writing it, Gerhard Lazu will do a demo of a app for buffering ICY streams using AMQP. A video of Alex's talk is available on the Skills Matter site. Morten couldn't make it, but hopes to be able to offer us this talk at some point in the future. Morten Bagai from Heroku might be in town and if so is going to give us an overview of their platform. His presentation will also cover where they're going in the near future, what they'd like to know from us and info on their plans for their European customers. StealingBorrowing an idea from the Sydney Ruby User Group we'll put aside some time at the start of the meeting where you can pass on information you think is of interest to the group. For example you could announce a new gem you've written or found useful recently, let people know about any interesting events that are happening soon or just bring people's attention to news or gossip within the greater ruby community. If you'd think about blogging it or starring it in your RSS reader, then mention it here. This section will last for about 10-15 minutes and anyone can speak if they keep it short and to the point! At the end of the formal part of the meeting we change into our smoking jackets and retire to the quiet backrooms of a local tavern for a snifter of brandy, a fine snub of tobacco for our pipes and try to outdo each other with increasingly outrageous anecdotes. The Crown Tavern is just down the street from the venue for the talks and is ideally located for this after-hours debating session. Those of us unable to make the main meeting should aim to arrive at The Crown Tavern at about 8pm if they want to join in the debate. We need people to register with Skills Matter if they are planning on attending. Registration lets Skills Matter know how many people to expect to turn up and plan the venue accordingly. There shouldn't be any capacity problems with the new venue, but you should still register as early as you can to help them out. The next meeting of LRUG will be on Wednesday the 8th of July, from 6:30pm to 8:00pm. As usual our hosts Skills Matter will provide the space, this time at a new venue The Crypt (it's very close to the other venues). We still need people to register though to make sure the room is set up properly. Tom Stuart will be talking about how abstract algebra is useful for Ruby programmers, both when writing everyday programs and when going to the pub afterwards. As an example he'll show how to use his VectorSpace library to compare and manipulate structured data for free. A video of Tomasz's talk is available on the Skills Matter site. After the meeting it's usual to continue the meeting in a more informal style at The Crown Tavern. This pub is just down the street from our new venue, in fact you'd have to walk past it on the way to the tube station, so it's hard to avoid. Speaking of avoiding things, if you can't make the main meeting, we aim to be in the pub from about 8pm and you're more than welcome to come along and help us prop up the bar. We need people to register with Skills Matter if they are planning on attending. Registration lets Skills Matter know how many people to expect to turn up and plan the venue accordingly. We shouldn't have capacity problems with the new venue, but you should still register as early as you can to help them out. The next meeting of LRUG will be on Monday the 8th of June, from 6:30pm to 8:00pm. As usual our hosts Skills Matter will provide the space at either their offices or one of their overflow venues. The venue we get is dependent on how many people register and the availability of sponsorship to pay for a larger room. Do your bit by registering early. A video of Patrick's talk is available on the Skills Matter site. DSLs are very powerful tools but are they always necessary? This is a tale in code about my work on a small 'Request Throttling' library where I thought I needed a DSL but it turned out I was sorely mistaken. I'll highlight some common DSLing techniques and the decisions that steered me away from them. A video of Abdel's talk is available on the Skills Matter site. A library for running tests across multiple applications from a single test case. Over 14% more awesome than a bag of chips. At the end of all this we like to drop our polite facade and scramble to be first at the bar and woe betide anyone that gets in our way. The pub we head to is The Crown Tavern, which is conveniently located close to all of the venues that Skills Matter provide. If the main meeting doesn't fit with your hectic schedule surely you can fit in a pint on the way home? 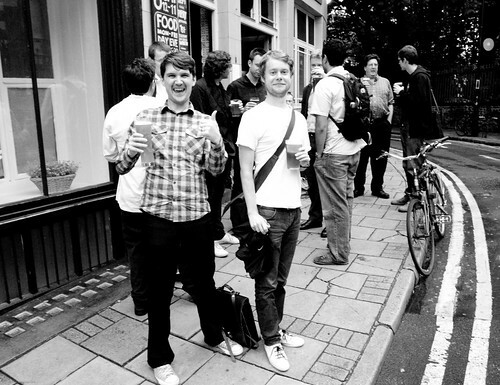 We aim to finish up the talks at 8pm, so come to the pub for then and chat with your local ruby community. We need people to register with Skills Matter if they are planning on attending. Registration lets Skills Matter know how many people to expect to turn up and plan the venue accordingly. If enough people register we need to book a larger venue, but that can take some time so Skills Matter need some notice to do so. So please register as early as you can. If you register late they might not have enough time to book a larger room and you might get put on a waiting list or simply turned away. We don't want that! The next meeting of LRUG will be on Monday the 18th of May, from 6:30pm to 8:00pm. As usual our hosts Skills Matter will provide the space at their offices. The room is currently at capacity, but if you register with them they'll put you on a waiting list. Regular expressions are great but they're unreadable when complex, and there are some things they just can't do. The alternative is to build a language parser - but that's really hard, isn't it? In this talk, I'll try and dispell that idea and show how building little languages in ruby is really simple. I'll show two examples: defining a mini-language from scratch to build XMPP bots, and using it as part of your screen-scraping toolbox. A video of Roland's talk is available on the Skills Matter site. Scheme is a member of the Lisp family of languages, and is an excellent place to start if you're interested in writing your own language. It's small and simple to parse, yet has several advanced features that are only now becoming mainstream. Based on Heist, my main interpreter project, I present a brief overview of Scheme and use Treetop to create a small runtime that includes booleans, integer arithmetic, variables, user-defined functions, conditionals, recursion and lexical closures. A video of James' talk is available on the Skills Matter site. 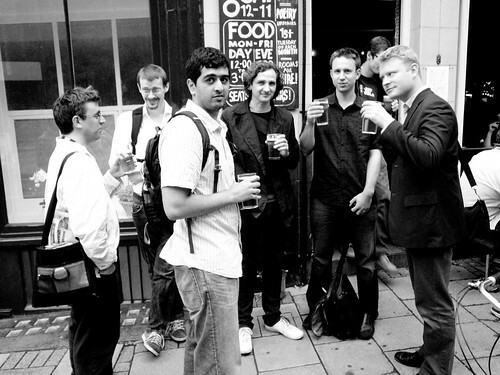 It's tradition at LRUG to head to the local pub after the talks to relax and chat with other rubyists. We go to The Crown Tavern which is a short walk from either of the venues Skills Matter provides. If you can't make the main meeting you'll find plenty of rubyists propping up the bar from about 8:00pm onwards after the talks. Come along! Please register with Skills Matter if you are planning to come (or even just thinking about it). Please register as early as you can. In fact, go and do it now! The reason for this is that if a lot of folk want to come we obviously need a larger room and Skills Matter need about a week's notice to book it. They'll only do so if the registrations dictate it. If you register late they might not have enough time to book a larger room and you might get put on a waiting list or simply turned away. We don't want that! The next meeting of LRUG will be on Monday the 20th of April, from 6:30pm to 8:00pm. As usual our hosts Skills Matter will provide the space at their overflow venue (if you've never been you can use this handy map to find it). On very busy nights we've had to turn people away, so make sure that you do register your attendance early to avoid this. Martin Kleppmann is the author of the invoicing gem (on GitHub) and is going to give a talk about it. The invoicing gem provides a solid basis for any commercial web app, by solving the standard problems of financial transactions neatly and concisely, allowing you to focus on the business logic, and being flexible enough to grow and handle pretty complex stuff when you need it: multi-currency support, international taxation and reseller networks, for example. Under the hood it's basically a full accrual accounting system, but that is hidden behind a clean Ruby API which requires no accounting knowledge. Martin will also touch on OAccounts, an initiative to create an open standard for exchanging accounting data between different apps. A video of Martin's talk is available on the Skills Matter site. Jon Gilbraith has been working on taking a modular approach to views and creating builder classes to abstract structural html and view logic into Ruby blocks. In this talk he's going to present that approach and some of the stuff he's learnt along the way. A video of Jon's talk is available on the Skills Matter site. Paul Jensen is going to give a talk about using Geokit, with a particular focus on it's use in Social Apps. Geokit is a rubygem and Rails plugin for geocoding, distance calculation, location finding, and ip address-based lookup. In this talk he'll run through the functionality provided by Geokit, and show off the magic in action with a google maps/twitter/trusted places mashup. A video of Paul's talk is available on the Skills Matter site. After three talks it's likely we'll need some kind of liquid comfort. Luckily there's a convenient pub just a short walk from either of the Skills Matter venues: The Crown Tavern. We aim to finish the talks and be crowding the bar by about 8:00pm. If you can't make it to the main meeting you should use this info to turn up at about 7:50pm and get the drinks in. Please register with Skills Matter if you are planning to come. You should register as early as you can, so do so now! If we need a big room Skills Matter need about a week to book it, and will only do so if the registrations dictate it, so registering late means you might get put on a waiting list or turned away. And we don't want that. The next meeting of LRUG will be on Monday the 9th of MArch, from 6:30pm to 8:00pm. As usual our hosts Skills Matter will provide the space, either at their offices or their overflow venue, depending on the number of registrations. On very busy nights we've had to turn people away, so make sure that you do register your attendance early to avoid this. Redcar is a programmer's text editor for Gnome, written in Ruby. In this talk I'll show off Redcar's features, and then take a look into how it's implemented. We'll also look at the Ruby-GNOME2 bindings, and how to interface Vala (a C# like language) with Ruby for performance. Daniel's even hoping to push his first milestone release of Redcar just before the meeting. You can track his progress on the Redcar lighthouse project. The talk will explain Story-Driven-Development(SDD) and its benefits. A sample application will be built in real-time using SDD with Rspec Cucumber. Tests will be run in-browser with FireWatir and through a headless-browser using Celerity and JRuby. A video of Aidy's talk, filmed by Skills Matter, is available on Google Video. It's tradition that after the talks we descend on The Crown Tavern, and make it difficult for anyone to get served at the bar for about 20 minutes. This pub is very close to Skills Matter, and only a short stumble across Clerkenwell "Green" from the overflow venue if we're using it, and therefore is perfect for our post-meeting activities. The meeting normally wraps up at about 8:00pm, so if you can't make it to that but still want to talk ruby, you'll find plenty of rubyists in this pub. Come along! Please register with Skills Matter if you are planning to come. As we mentioned above, they need us to register for fire-regulations and making sure we get the best sized room for the number of attendees. The next meeting of LRUG will be on Monday the 9th of February, from 6:30pm to 8:00pm. As usual our hosts Skills Matter will provide the space, either at their offices or their overflow venue, depending on the number of registrations. So make sure that you do register your attendance to help them choose and so you can be let into the venue. This month (just like we did last February) we're going to have a series of lightning talks in the 20x20 slide format. For those who didn't attend last year, or aren't familiar with the format is: the presenter has 20 slides which are displayed for 20 seconds each, giving a total presentation time of 6:40. Last year it was a really fun evening as we got to hear about a load of different stuff and with only 6:40 in which to get their point across the presenters maybe didn't have enough time to fully justify their positions. It made for some interesting questions at the end! Tom Armitage - His Twit 4 Dead bots (Francis, Louis, Zoey & Bill). Video filmed by Skills Matter (or gvideo). Julian Burgess - A cry for help - an anti talk? Chris Lowis - Ruby and the GNU Scientific Library and/or R. Video filmed by Skills Matter (or gvideo). Matt Patterson - A talk about dpkg-tools. Video filmed by Skills Matter (or gvideo). Thomas Pomfret - Ruby and XMPP. Video filmed by Skills Matter (or gvideo). Roland Swingler - Something about rubygame. Video filmed by Skills Matter (or gvideo). Tom ten Thij - Debugging with ruby-debug. Video filmed by Skills Matter (or gvideo). After that many presentations there's bound to be a lot to talk about, so we'll make our way to The Crown Tavern. This pub is really close to either of the venues we use for our meetings and is perfect for a post-meeting chat and drink. If you can't make it to the meeting, but still fancy some ruby chat, just head along to the pub and we'll be the ones crowding the bar from about 8:00pm onwards. The next meeting of LRUG will be on Monday the 12th of January, from 6:30pm to 8:00pm. Skills Matter are hosting us as usual in their offices, but you'll need to register your attendance for them to let you in. Paul Carey has been tinkering with CouchDB for a while and has even written a ruby library called RelaxDB for it. In his talk he's going to cover both of those things. A video of Paul's talk, filmed by Skills Matter is available on Google Video. Paul Mison is going to do a short talk on libraries and abstractions for website APIs. Specifically how he thinks they should be written (and how he thinks they shouldn't be). The talk will mostly focus on Flickr, so an understanding of Flickr's API and the existing abstractions might be of use. There's always time for a drink after the meeting and we usually head to The Crown Tavern which is just round the corner from the venue. If you can't make it to the talks part of the evening, the pub should be overflowing with ruby chat from about 8:00pm onwards, so come along! Please register with Skills Matter if you are planning to come. They need us to register for fire-regulations and making sure we get the best sized room for the number of attendees.